Today (Thursday): Sunny and hot, slight chance isolated late day thunder. Highs in the 90s. Overnight Thursday Night: A round of storms possible first half of night. Lows in the 60s. Friday: Hot, but not as humid. Highs around 90. We're looking at the steamy prospects of another day in the heat and humidity. 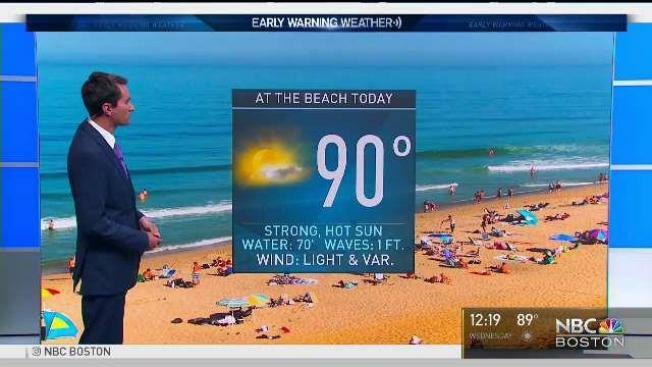 With highs again approaching the low 90s in Southern New England, you might hear the beach or the lake calling again. If you can't heed the call, at least take it slow and find some A/C. As this cool front settles across Southeast Massachusetts, Rhode Island and Connecticut on Thursday night, a burst of energy will ripple overhead in the jet stream. This may spawn a few late night storms across the region, with the focus on Connecticut and Rhode Island. If they do form, beware of frequent lightning and intense bursts of rain. These things are fickle when they try to form over New England. Many times they revert to just a few passing showers, but sometimes they overachieve and startle a lot of people in the middle of the night. The end result will be a slightly cooler day Friday and a slide into the 70s by the end of the weekend. Speaking of, it starts nice and then succumbs to clouds by Sunday afternoon. Looks like we may hold back the showers until late, but this is a work in progress. If our weather system speeds up, we might be seeing them by early afternoon.